Fox News viewers really do see the world differently. The sharp differences in opinion extend to beliefs about political corruption, voter fraud and media coordination with campaigns. Fox fans, when compared to fans of other networks, are far more likely to express concern about November's election results being manipulated. Suffolk's polls ask many of the same questions that other pollsters ask during presidential election years -- but add a layer of questions about media consumption on top. The Suffolk pollsters ask: "What TV news or commentary source do you trust the most?" In the most recent poll, 270 of the 1,000 respondents said Fox -- the single highest result of any of the networks named in the poll. This reflects Fox's tight grip on conservatives. More than 70% of the respondents who chose Fox described themselves as "conservative" or "very conservative." 154 respondents said they trusted CNN the most. The rest chose MSNBC, ABC, NBC, CBS, C-SPAN or PBS. A small number chose Comedy Central. The smaller the numbers get, the wider the margin of error, and the less reliable the data becomes. But Suffolk's poll is clear about the divergence between Fox loyalists and others. An example: Only 14% of people who say they trust Fox the most say the country is headed in the right direction. 81% say it's on the wrong track. The divide is not nearly so extreme among other respondents. For example, 55% of people who rate CNN as their most-trusted source say "right direction," and 35% say "wrong track." Suffolk's polling can't answer the obvious chicken-or-egg question. Do people have these views because they watch Fox, or are they drawn to Fox (with its "fair and balanced" slogan) because they already have these views? In many cases, the opinions of self-described "conservative" and "very conservative" people overlap quite closely with Fox loyalists. In Suffolk's most recent poll, 74% of people with conservative views, 73% of people with very conservative views and 84% of people who trust Fox the most say they have an unfavorable opinion of Clinton. Overall, 61% of respondents have an unfavorable view of Trump, while 31% said their view of him is favorable. Among Fox's partisans, the numbers are flipped, with 68% reporting a favorable view of the candidate and 23% reporting an unfavorable view. When asked "if the general election was held today... for whom will you vote or lean toward," 83% of Fox loyalists said Trump and 11% said Clinton. On the flip side, 77% of CNN loyalists and 94% of MSNBC loyalists said Clinton. People who trusted Fox the most were also far more likely than people who trusted CNN, MSNBC or other channels to say that recent revelations from hacked emails released by Wikileaks raise conflicts of interest for Clinton if she is elected president. 85% of Fox fans said yes, according to the poll, compared with 45% of CNN fans and 15% of MSNBC fans. Some of these findings are just predictable examples of polarization. But the poll also shows that Fox loyalists are more susceptible to claims of election corruption. Suffolk asked, "If the candidate you support loses," will you feel that "the other candidate won fair and square and deserves the support of all Americans," or that "corruption cost your candidate the election, and the new president shouldn't be seen as legitimately elected?" 43% of Fox loyalists cited corruption, versus 28% of overall respondents. 65% of Fox loyalists in the poll said they are worried that election results could be manipulated, far higher than the 38% overall response. Only 12% of MSNBC fans and 19% of CNN fans said they shared the concern. Conversely, only 31% of Fox loyalists agreed with the view that the election results can be trusted to be fair and accurate, compared with 77% of CNN viewers, 85% of MSNBC viewers, and 57% of overall respondents. Among people who are worried about the security of the election, many Fox fans expressed concern about the news media trying to "change the election results" -- possibly a result of Fox's anti-media tone. 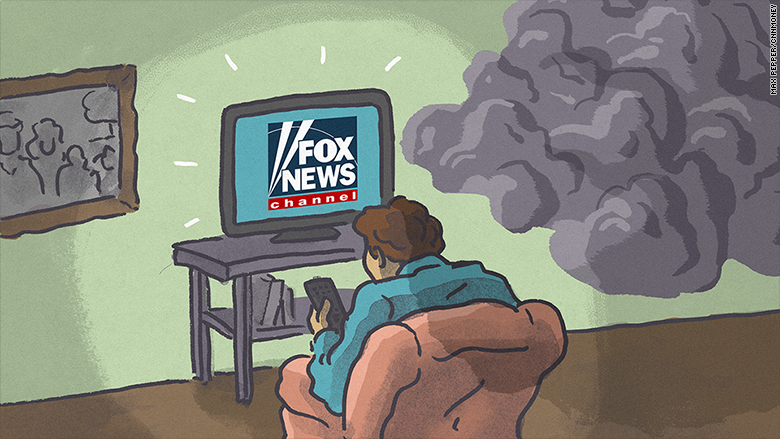 Fox allies might say the poll findings show that other channels have a liberal bent. Fox critics might say that the results illustrate the echo chamber of conservative media. "The conservative entertainment news complex has constructed an alternative reality so all-encompassing that the chance of conservatives happening on any sort of good news is virtually nil," USA Today contributor and National Memo columnist Jason Sattler wrote on Thursday. "Hosts teach their viewers how to debunk anything Democrats might claim as an accomplishment and make sure they believe six terrible things about Obama before breakfast." Suffolk's pollsters asked, "When it comes to the economy, do you think we are in an economic recovery, stagnation, recession, or depression?" Overall, 38% of respondents said a recovery; 35% said stagnation; 12% said recession; and 8% said depression. CNN and MSNBC regulars were more bullish. But Fox viewers were the opposite. Only 11% of Fox loyalists said America is in an economic recovery; 50% said stagnation; 19% said recession; and 13% said depression. Suffolk conducts the national polls on a regular basis, including questions about media consumption. The Washington Post noted that the data for the past 15 months shows that "people who trust Fox News the most have consistently viewed Trump positively, on net," compared to people who trust other networks the most.